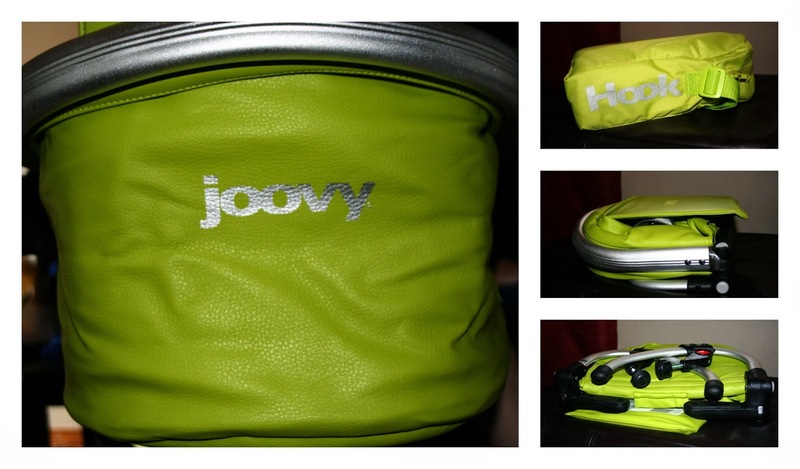 Joovy Hook Review ~ Clean Eating on the Go! 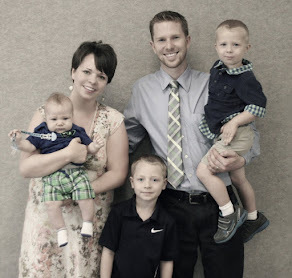 I am delighted to be a Joovy Mom and bring you evaluations from a great family run company. My paramount product I wanted to review was the Joovy Hook! Basically, trying to eat out with Little H is much harder than it was with his older brother. He is a little Houdini and the community high chairs not only gross me out but they are hazardous with Little H, half the time the belt is missing and then when there is a belt he turns sideways and stands up! 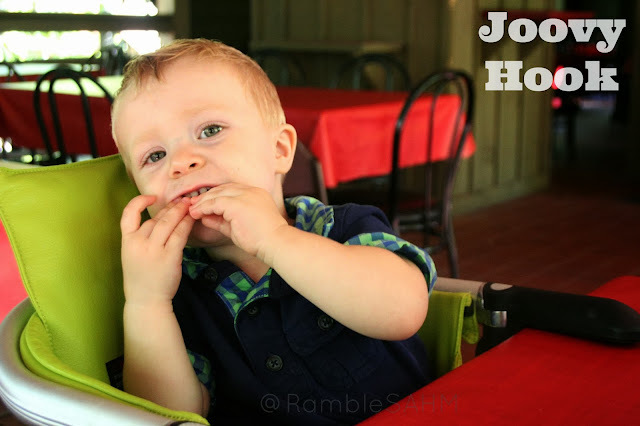 Hence, what led me to pick the Joovy Hook for review…yes it was pure desperation of wanting little H to sit in his own chair and not my lap! The other reason is Thanksgiving is coming up and we never seem to have enough chairs for the meal and I supposed the Hook would be a great way at keeping a chair open but allowing us all to eat at the same table. When the Hook arrived I was eager to see it was compact, lightweight and even comes in its own carrying case. The color is bright and with the fabric being Leatherette it is easy clean and maintains its bright color. The Hook is sturdy and can hold up to a 35lbs toddler. I also like that is comes with an adjustable three point harness that cannot be unbuckled. I don’t know about your children but mine eat better when we are collected at the table. I think it is so important that they learn table manners and the hook provides that chance. What also keeps Houdini in is that the Hook is deep (10.5 inches to be exact!) and the leg holes make it impossible for Little H to stand up in it. The photo above is of Little H throwing a fit and even when he leans back throwing a fit it is still too deep for him to fall backwards. This is the first highchair that my son cannot get out of or push it away from the table. I think the bottom line for me is that the Joovy Hook is safe and well-designed as well as it is stylish. I truly like Joovy’s fashionable colors and how they brand their products to look fresh and exciting. 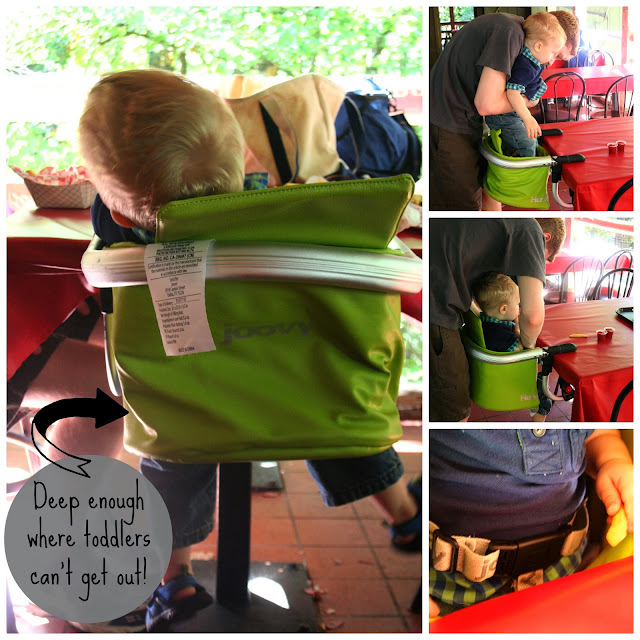 I would recommend the Joovy Hook for people who travel and for a child that is persistently trying to get out of their highchair. Also, if you want to sit together as a family but still have a chair then I would say the Joovy Hook is the picture-perfect solution! Connect with Joovy on Facebook, Twitter, Instagram, and Pinterest! 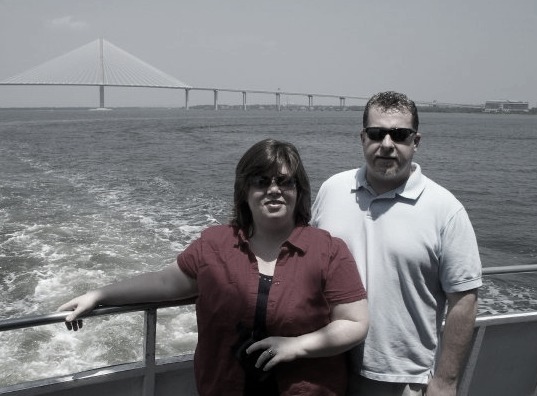 Purchase the JoovyHook for $69.99, available in colors Grennie (as seen pictured ), Orangie, and black! I love, love, love the Hook it was the only seat my daughter used at home for months,made her feel like a big girl! The Joovy Hook looks like an amazing seat, I love how much room it saves you compared to a highchair and that they can sit right at the table with everyone! Thanks for the review! 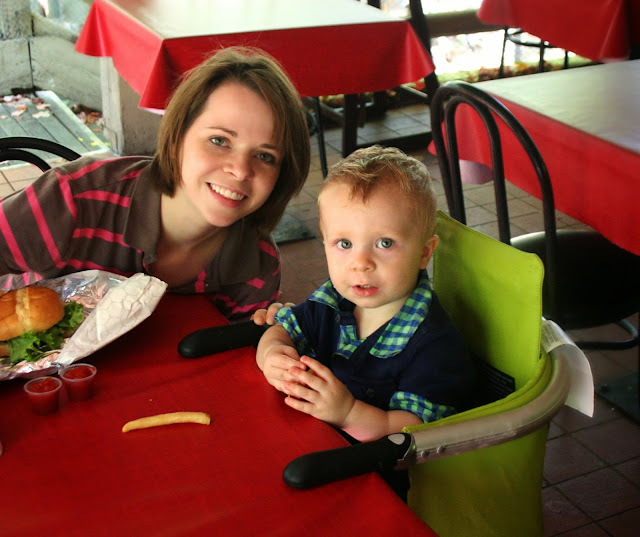 Yes love the extra space and baby at the table too!